I Put My Mind to This. This is “Playing a Little Love. 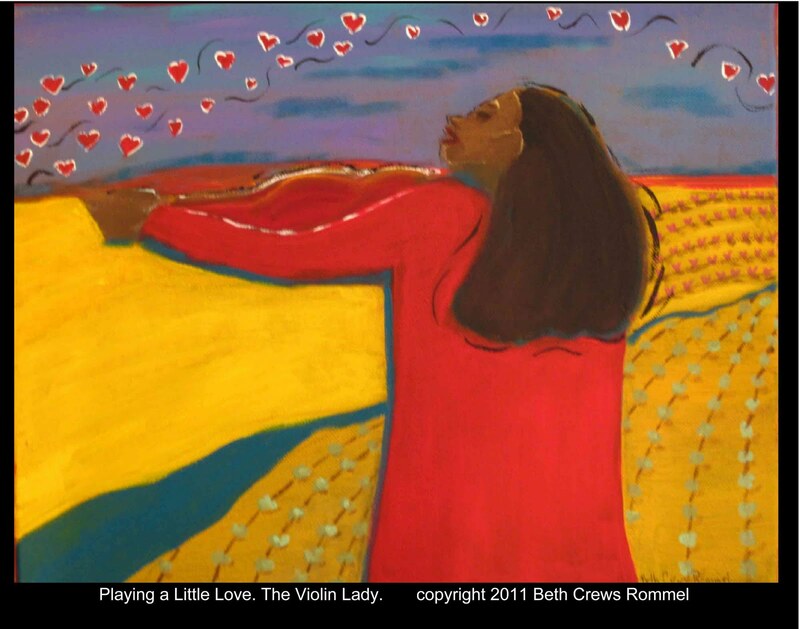 The Violin Lady.” She is now being shown at Artistree Co-op. Painting something joyous is a good counter to the graphic design projects I do on the side. Or is it I paint on the side? The graphics have been my mainstay since I graduated from college in the “cut and paste” days. My job producing yearbooks took me out of the dark ages into the forefront of technology where I learned to use photoshop and indesign. I am eternally grateful for that job. I left my comfort zone and learned so many things. The most important thing I learned is that I could do whatever I put my mind to. I am going back through the curriculum from Alyson Stanfield’s Blast Off class. I took the class a year ago and have decided to revisit my goals, tolerations, etc. I rewrote my affirmations. 1. I choose to build others up. 2. I choose to have faith and believe wholly in God. 3. I choose to be healthy: to eat fruit and vegetables and exercise daily. 4. I choose to dispose of the unnecessary, unkind and untrue. 5. I choose self discipline and strength. 6. I choose to grow in vision…see more of what the world and others have to offer. There are more, but they are not relevant in this post. I will put my mind to these, as I can do whatever I put my mind to. Even number 3…ugh. Beth,I like the new direction of this work. It's as if the figure and the landscape are one–the broad sweeps of color dovetail beautifully.Your affirmations have a ring of truth and courage–words you can really live by. Thank you Dianne and Deanna. As my dad said,"onward and upward" in this new year. Your painting is incredible Beth. I can see those little hearts actually floating around to the tune. And your affirmations are inspiring! Love that painting Beth! You can't help but feel good when you look at it. Thanks for sharing your affirmations… and yes – we can do whatever we put our minds to. Thanks for the reminder!